When you start using Alfred regularly to launch apps and find files, you'll quickly find that Alfred presents you with the right results. But how can you ensure you always get what you want? Prefer using "s" to launch Spotify rather than Safari? Simply select Spotify a few times when typing "s" to teach Alfred this is the app you want to match. No need for fancy steps; Alfred will learn, and the more you use him to launch your apps and files, the more he'll add to his knowledge. The next most important step to get the right result quickly is setting the scope of the results you want include in Alfred's search. By default, when you type your search term with no prefix, Alfred's search scope includes Applications, Contacts and Preferences in the locations set in Features > Default Results. I like to add folders to these results, and we offer a few additional file types you can add. To keep your results tidy, don't add all available file types; Just your essentials for types you'll need instantly. To search for a broader set of files, including your images, PDFs, music and more, the spacebar is your friend. To open a file, type "open" or press the spacebar, followed by the name of your file. You'll see all the relevant results, and you may need to scroll down if there are a lot of results - Just use the arrows to keep navigating down the list. Press Enter to launch your file. There are two other useful keywords; "find" will reveal the file in Finder instead of launching it and "in" will let you search for the content of files, such as text in a document. 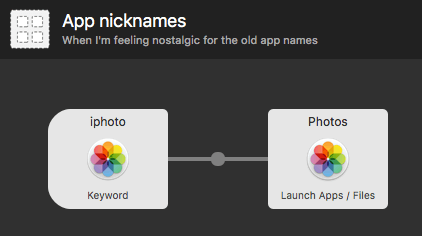 Let's say the app you want to launch is Photos, but you keep calling it "iPhoto", out of habit or nostalgia for the old days. You can create a simple workflow using Templates > Files and Apps > Launch file group from keyword or by creating your own blank workflow and connecting a keyword to a Launch Apps/Files object. You can add multiple objects to this particular workflow, connecting each app you want to launch to its respective alternative keyword. Why did I put this simple option second? OS X can require permissions to add tags & comments to System files, which can make it a little fiddlier. However, using Tags to label your files can be a very powerful way to search for files. Our guide to using OS X tags for better search can help you make the most of tagging. We love file filters so much that we've included an example workflow to show you how smoothly they can help you find what you need. To add it, click the [+] at the bottom of the Workflows preferences, and choose Examples > Dynamic File Search. You could even add an extra filter object to set the file types you want to search for. This shows just how flexible Alfred's search is; Whether you just want to get the right app first, or dig out obscure files in the depths of your file system, your results are just a few keypresses away! Take a look at the Tips and Tricks category for more ideas on how to make the most of Alfred. "Alfred" is a registered trademark of Running with Crayons Ltd. ©2019 Running with Crayons Ltd. All rights reserved.